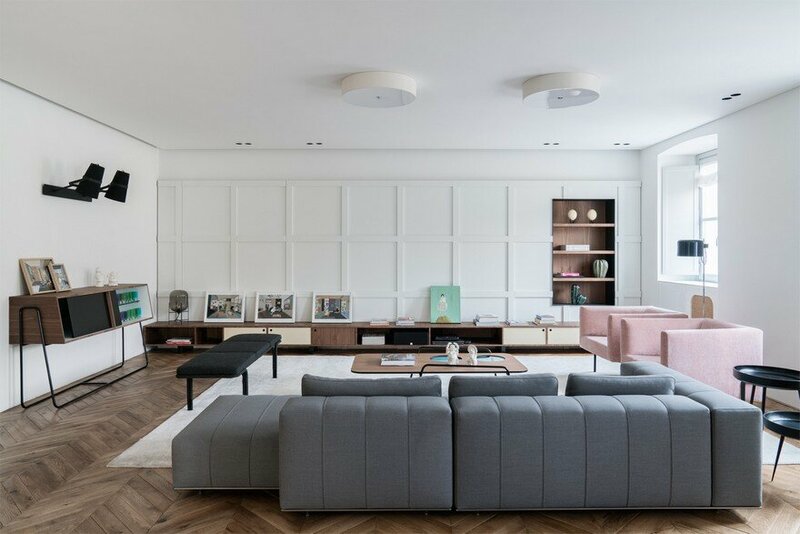 Designed by Fabio Fantolino, Lagrange House is located in the heart of the city of Turin. 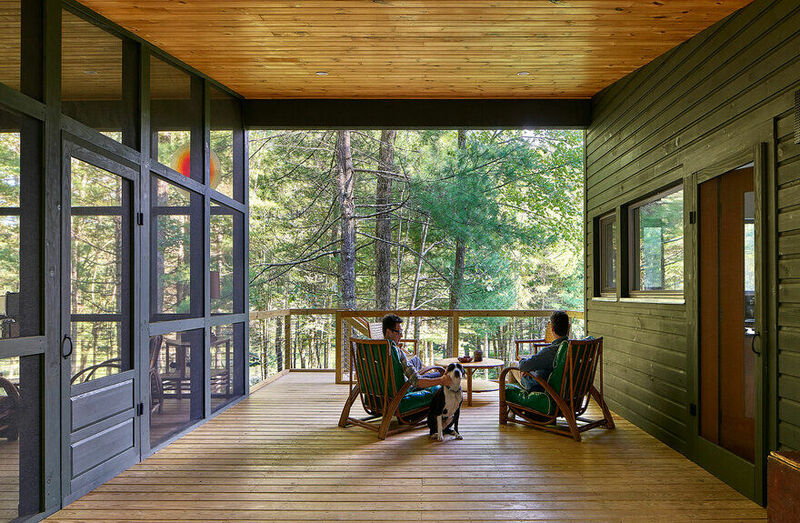 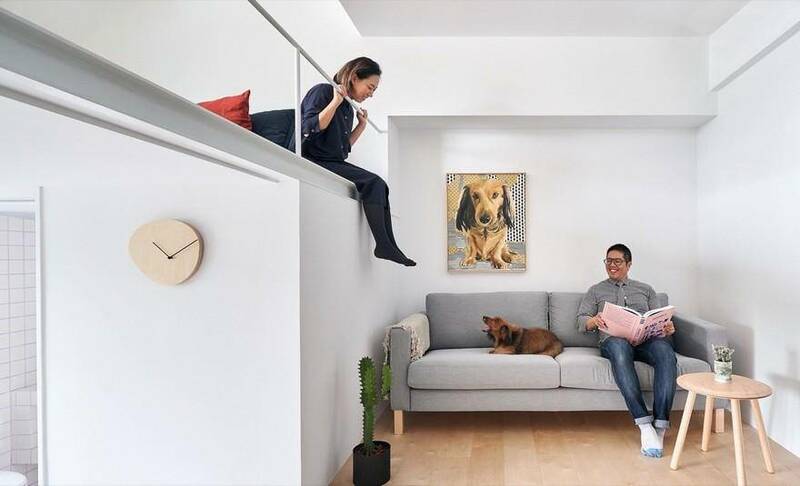 Two apartments in one inhabited by mother and son, perceived as a single space that may be divided allowing each to preserve a sense of individual personality and independence. 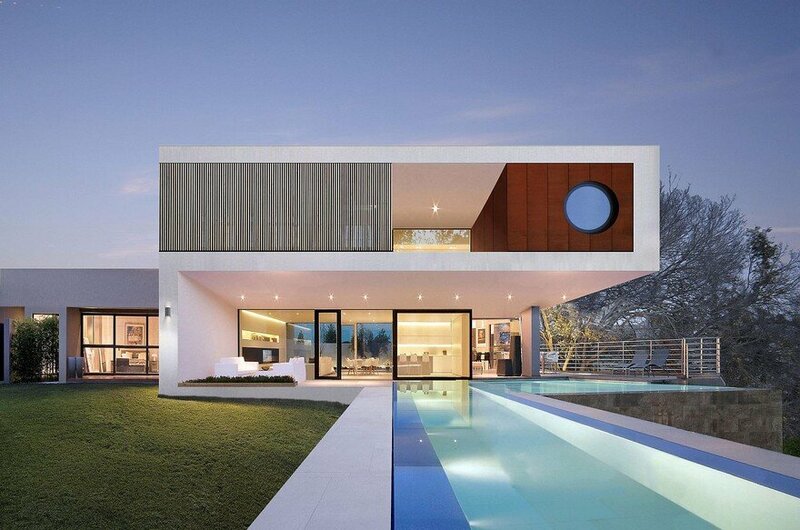 The internal design is inspired by the styles of the 1950’s and 1970’s, each a contamination of the other. 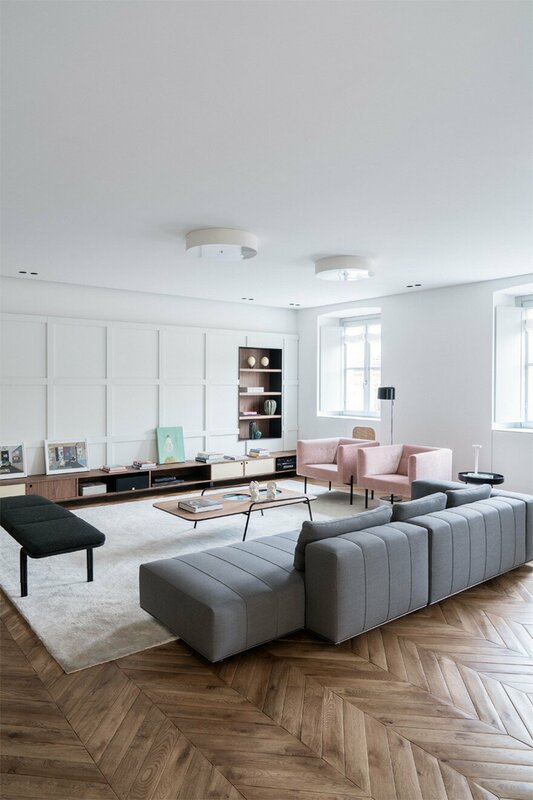 The hand-sanded Hungarian oak herringbone flooring sets the scene for the entire project. 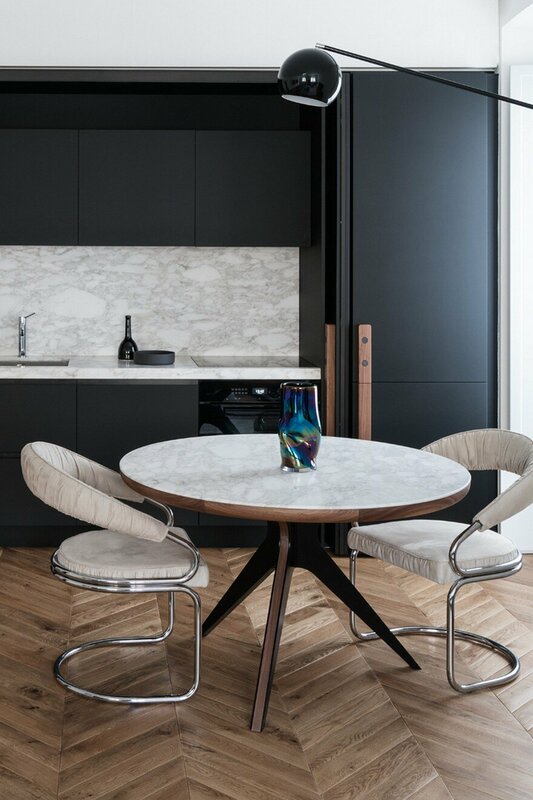 Some items are found in both apartments: the handles, the round table in the dining area. 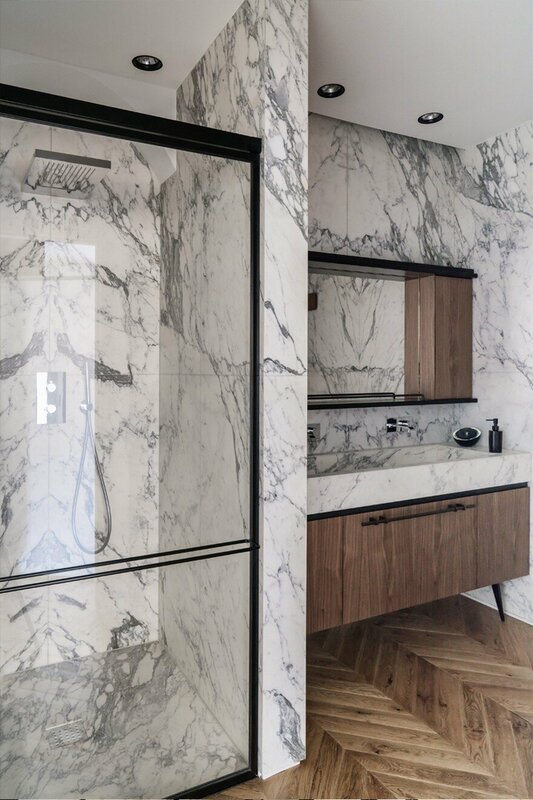 The mother resides in the larger apartment, which is elegant and sophisticated thanks to the richness of the materials used, the marble, the fabric and the highly polished steel features. 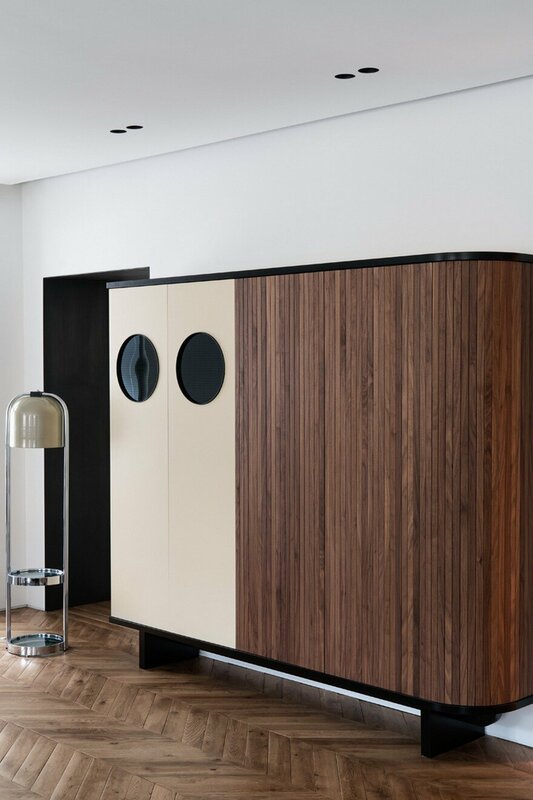 The flavour of the 1950s finds its greatest expression in the living area which, apart from its elegance offers different areas of expression. 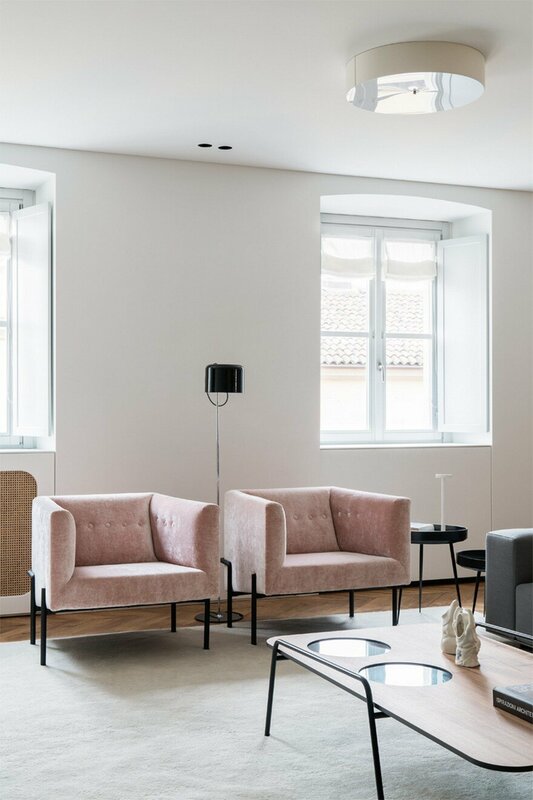 The conversation area is developed around a Minotti Freeman Tailor sofa, featuring a rigorous cotton titanium-coloured fabric and a double-stitched linear motif, typical of the 1950’s, contrasting with soft elements such as carpets, De La Cuona pale pink velvet-covered armchairs with Bowl by Mater tables at their sides. 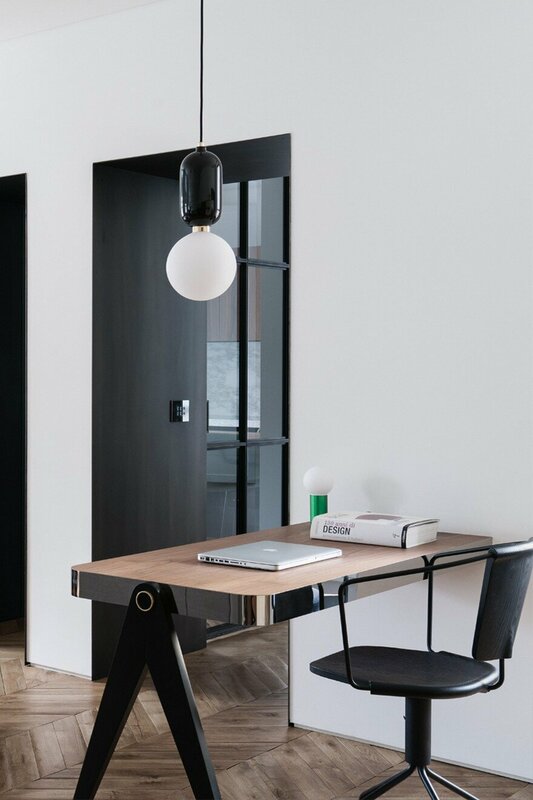 The study area has a walnut desk, softened by the light from an Aballs T by Parachilna suspension Lamp. 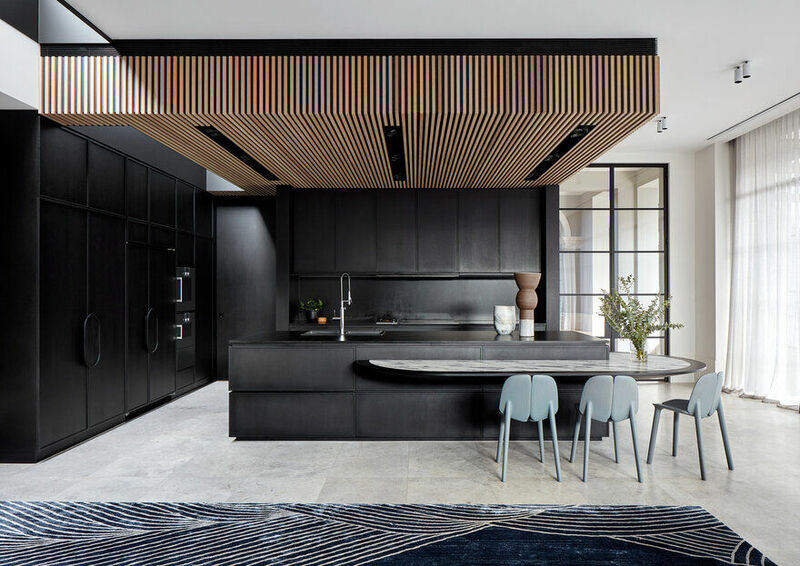 The Calacatta gold marble table surrounded by dark velvet Verpan chairs with a black structure is in the centre of the dining area, illuminated by the warm light from a black Tango lamp from the Phanto collection. 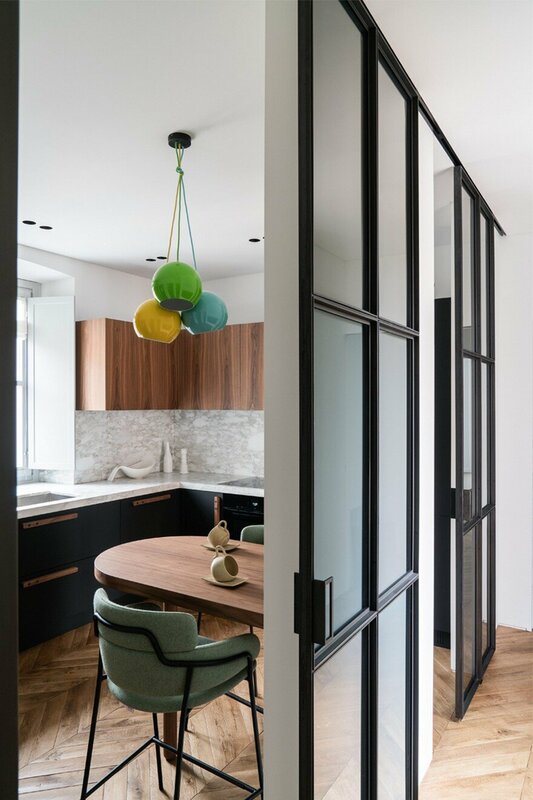 The setting is completed by two parallel niches and a black burnished iron archway: a glass showcase for dishes and an opening allowing for a glimpse of the kitchen in black fenix with shelving in American walnut enriched with Calacatta gold marble interspersed by Topan VP6 coloured pendants by &Tradition. 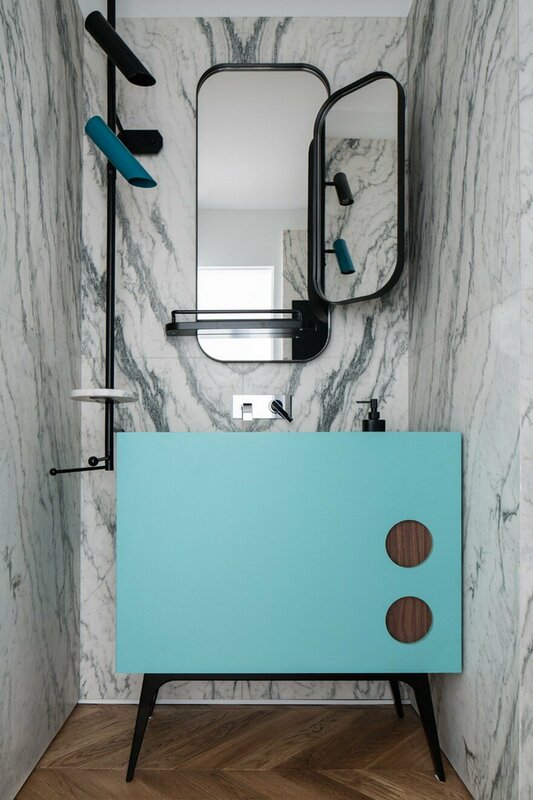 The guest bathroom maximizes the richness of Arabescato marble used as a vertical lining which contrasts with the aquamarine door of the washbasin cabinet with circular walnut particulars. 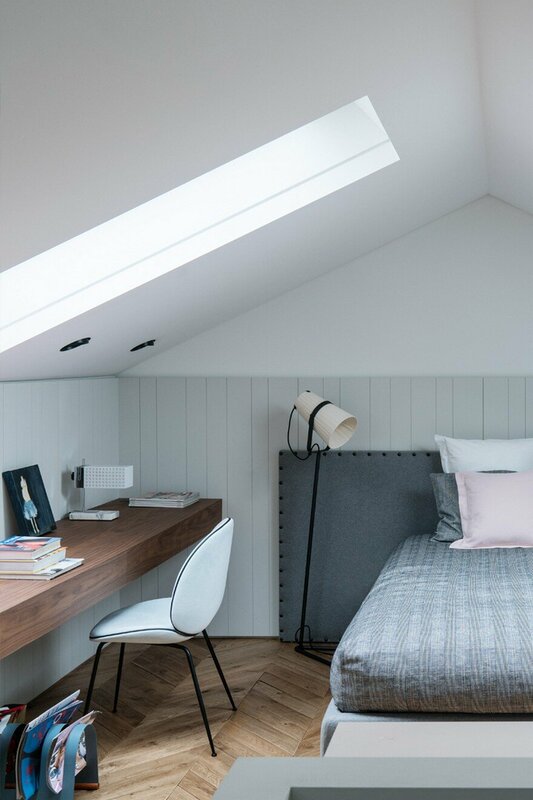 The upstairs sleeping area is conceived as a haven, an intimate place between the delicacy of light grey wood panelling, a Phanto PawFloor lamp and a Verner Panton black flowerpot bedside lamp. 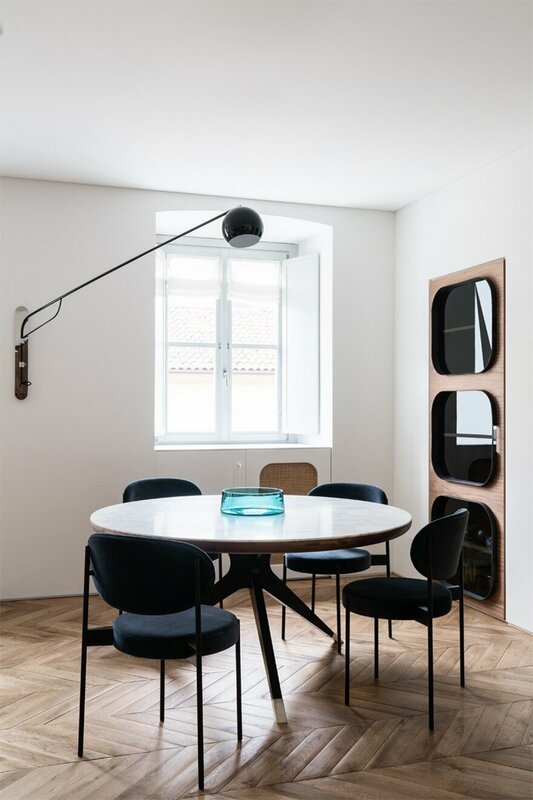 To further define this atmosphere, the Gubi Beetle Chair seat with a black structure and velvet lining and the table lamp designed by the architect Fabio Fantolino. 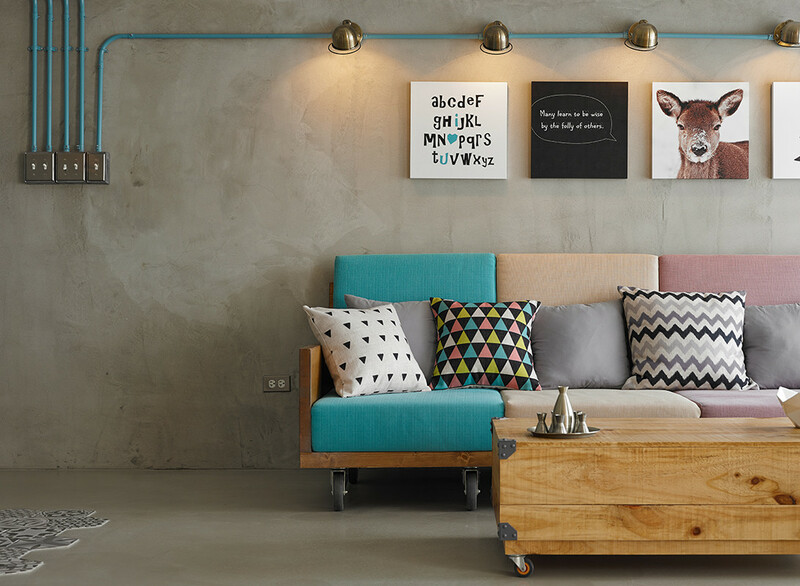 The smaller apartment has a design closer to the ’70s. 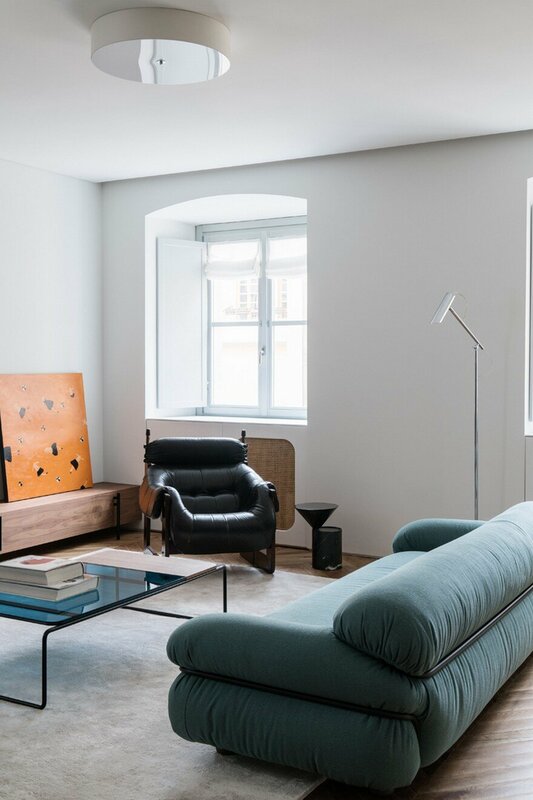 The lounge has a more contemporary and informal air, a Percival Lafer vintage leather armchair, a petrol-coloured Gianfranco Frattini for Tacchini sofa and light alcantara chrome-plated tubular chairs. 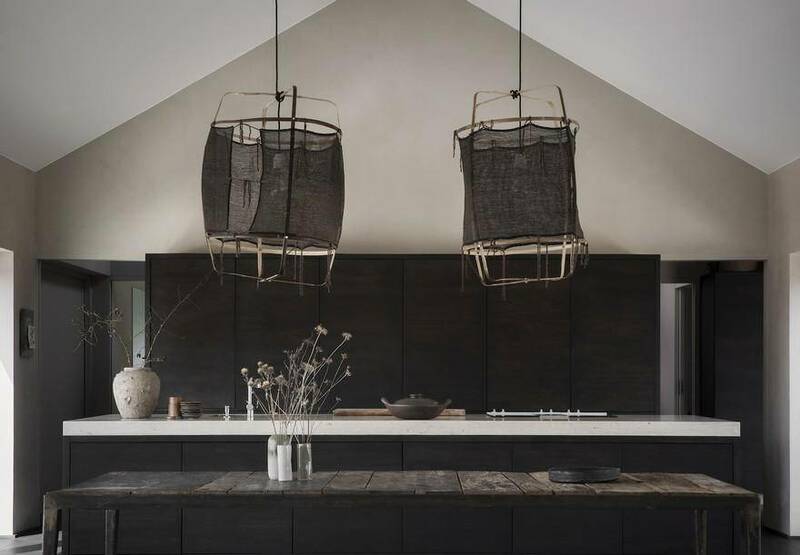 The kitchen can be closed-in on itself, serving as a background to the dining area. 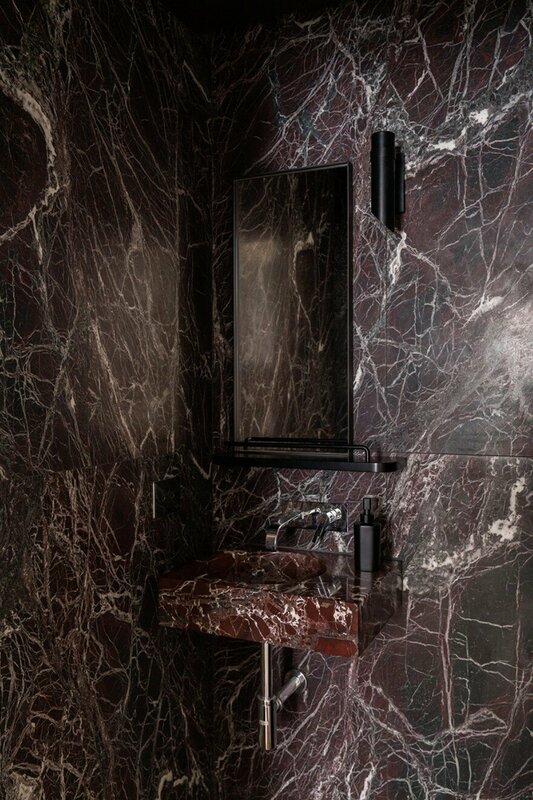 The guest bathroom has dark tones in red Levanto marble with details in black and chromed iron. 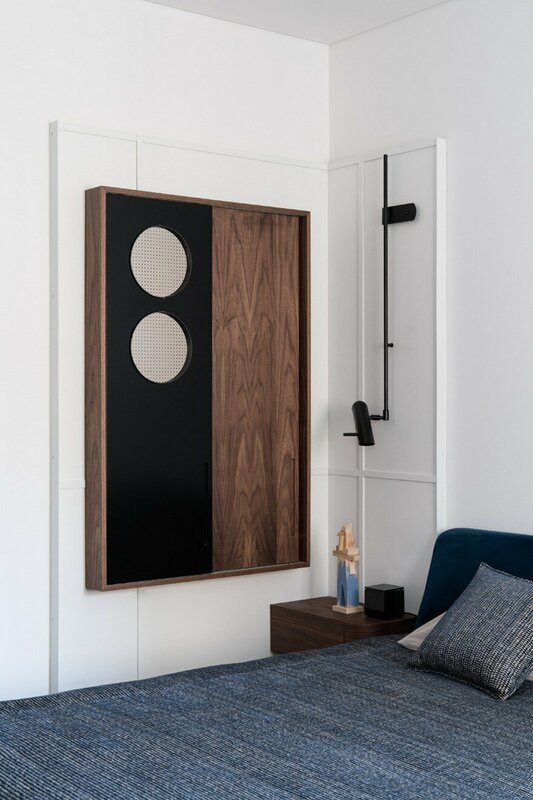 The sleeping area features a blue velvet headboard and a corner white panelling in the corner that houses a wall cabinet, bedside table and custom made lamp. 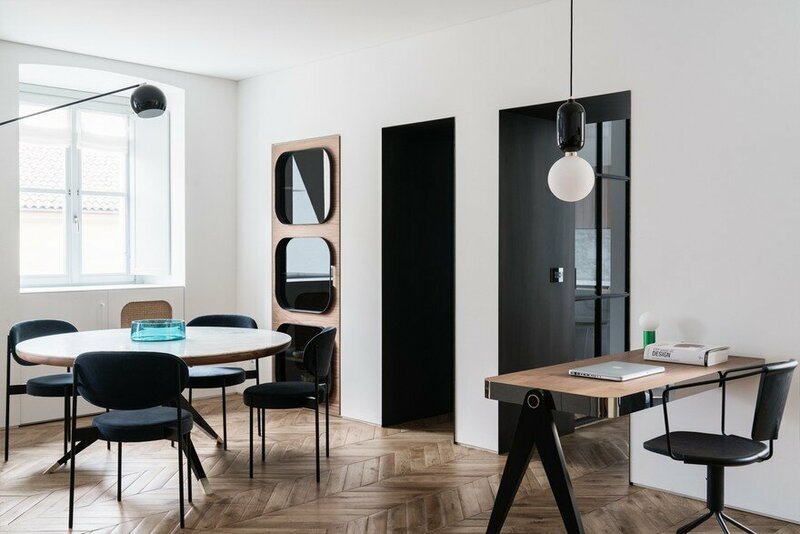 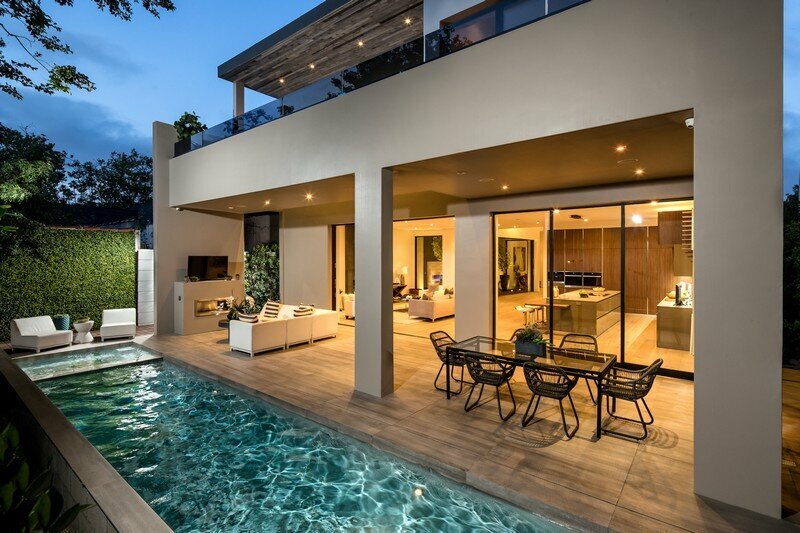 The bond between the two home owners and, consequently, between the two apartments is underlined by the seamlessly laid floor and airs details that represent a unique design that adapts and models the personality of the individual, revisiting different historical eras that are exalted by the use of contemporary design icons.